Dru Hill is an American singing group, most popular during the late 1990s, whose repertoire included R&B, soul, and gospel music. 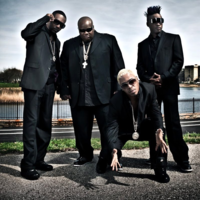 Founded in Baltimore, Maryland, and active since 1992, Dru Hill recorded seven Top 40 hits, and is best known for the R&B #1 hits "In My Bed", "Never Make a Promise", and "How Deep Is Your Love". Tamir "Nokio" Ruffin was the group's founder; his bandmates included main lead singer Mark "Sisqó" Andrews, Larry "Jazz" Anthony, and James "Woody Rock" Green. Signing to Island Records through Haqq Islam's University Records imprint, Dru Hill released two successful LPs before separating for a period from late 1999 to 2002, during which time Sisqó and Woody released solo albums. While Woody's Soul Music LP was a moderate success in the gospel music industry, Sisqó's Unleash the Dragon LP and its hit single "Thong Song" were major pop successes, and established Sisqó as a household name outside of Dru Hill. In 2002, by then part of the Def Soul record label, the group reunited and added fifth member Rufus "Scola" Waller to the lineup for their third album, Dru World Order.